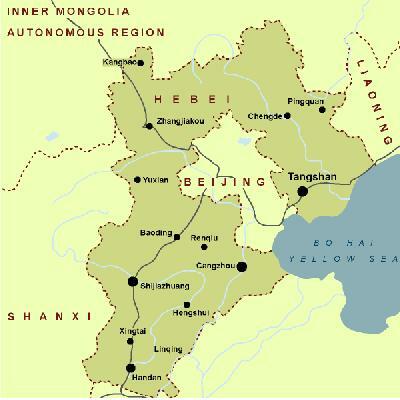 As Hebei surrounds the nation's capital, Beijing, it is a geographically important province. It is situated 36"01"-42"37" north latitude and 113"04"-119"53" east longitude. North of the lower reaches of the Yellow River and along the Bohai Sea in the east, it has an area of more than 187,700 square kilometers. 43% of the plains are less than 100 meters above sea level. Hebei Province has a temperate continental monsoonal climate, with dry and windy springs, hot and rainy summers and dry-cold winters. Its maximum temperature is 40oC and minimum temperature -18oC. It has a mean annual temperature of 1-13oC and a mean annual precipitation of 350-750 mm. It is divided into 11 prefecture-level cities, 32 county-level cities, 109 counties and 6 autonomous counties, with a population of 67.44 million by 2000, mainly ethnic groups of Han, Hui, Manchu, Mongolia, and Korea. Baiyangdian preserved egg, Bohai prawn,and etc. Artistic genres of Quyi such as Xihe big drum, Leting big drum, etc. The special local products include Zhangbei mushroom, Hebei pears, Xuanhua grapes, Shenzhou honey peaches, Tangshan pottery and Zhuzhou blankets. Hebei Province, Ji for short. Hebei's long and proud history can be traced back to the Spring and Autumn Period (770-476BC). At that time it was called "the Land of Yan and Zhao", because its northern area was dominated by the Kingdom of Yan, while its southern area was occupied by the Kingdom of Zhao. Hebei has highly developed agriculture, together with fishery, iron industry and pottery manufacturing. It abounds in mineral resources, such as petroleum, limestone, asbestos, phosphorus, vanadium, platinum and lead, the reserves of which are the most abundant in China. Communications in Hebei Province are very convenient. Mainly, there is railway, highway, water transport and aviation. Qinhuangdao, with throughput ranking second in China, is the important port of the ocean shipping. Hebei abounds in historical and cultural resources. The places of interest include the Shanhai Pass, the Chengde Mountain Resort, the Waiba Temple, Qinhuangdao, Beidaihe River, Yeshanpo Hillside and so on. The Zhaozhou Bridge was listed as World Cultural Heritage in 1991 and the Iron Lion in Cangzhou of Hebei Province was listed among China's World Best. The Shanhai Pass, widely known as the First Pass under the Heaven, is a small, sleepy town and port of the northern section of the Bohai Gulf, holding the access between northeast China and north China. Shanhai Pass (Mountain & Sea Pass), 15 kilometers from the tourist city of Qinhuangdao, got its name from its location between Yanshan Mountains and the Bohai Sea.